1A View of the Creek is the perfect cabin in so many aspects. 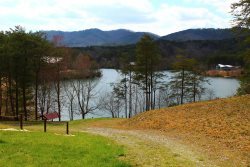 This pet friendly cabin on a trout stream is located between Blue Ridge GA with all of it's shopping and restaurants and the Ocoee River with it's outdoor adventure and whitewater rafting. It is cozy and warm enough for a romantic weekend for 2 yet will sleep 6 for friends or family. You will enter through a fully furnished kitchen boasting granite counters and dishwasher. In the living room you have a sleeper sofa, reading chair, board games, Wifi, flat screen TV w/DVD player, wood burning fireplace and ceiling fan. The bath has a newly remodeled tile walk in shower. The master has a queen-size bed with top quality mattress, flat screen TV and closet. The second bedroom has a full-size bed with top quality mattress, matching dresser and chest of drawers, and a flat screen TV.. There is a full size washer & dryer.The loft offers a wooden spiral staircase and a foosball table Once you step onto the deck you have entered an outdoor living area complete with 4-6 person Hot tub, campfire pit, hammock, gas grill, screened patio and a tiered deck with everything overlooking Fightingtown Creek. There is also a semi private outdoor shower, a large flat front yard and a paved driveway. Imagine yourself being serenaded by the sounds of Fightingtown creek (with or without your fishing pole) in this unique cabin. Who could ask for more! 1A View from the Deck-You can`t be any closer to the water without being in it! We loved it so much, we stayed an extra night! ★ ★ ★ ★ ★ I had a great stay at this cabin with my hubby and our pups!The creek in the back was very peaceful and our dogs loved to hang out with us on the back patio. The cabin was very clean and well kept and was stocked with everything we needed during our stay. I would definitely stay in this cabin again and next time we will bring friends since there was plenty of room. We loved it so much, we stayed an extra night! Very cozy, quiet, pet-friendly cabin with all the amenities. Left on Jan 10, 2017 for a stay in Dec 2016 Stayed four nights here between Christmas and New Years, 2016. Thoroughly enjoyed the stay in this cabin. The dog enjoyed the fenced yard as he is a very energetic ball chaser! The cabin offers almost everything youd want in a resort cabin , great living quarters, deck out over the river, and hot tub.Definitely would stay here again. We went at the last minute, and the host was very responsive. We found the house fairly easily, it was just as described with a nice interior. Perfect for four people. I truly loved the way the porches basically put the house out over the river/creek. Fabulous burbling!